b.j. 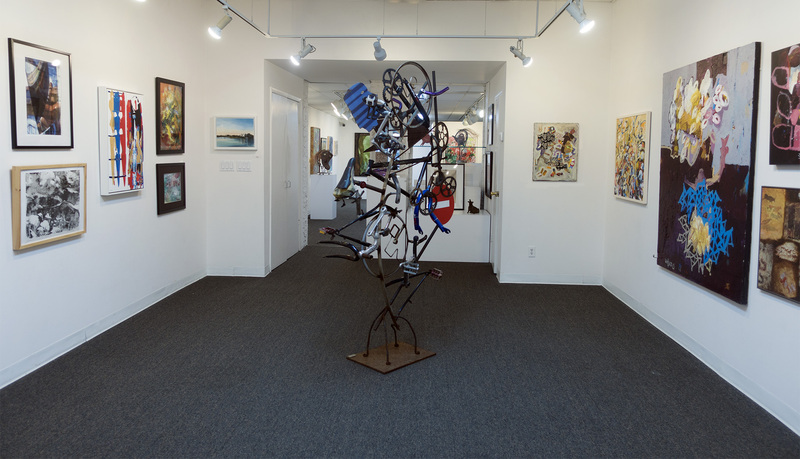 spoke gallery is a member-owned and run, not-for-profit, cooperative art gallery, that has been a vital part of the Long Island arts community for 43 years. b.j. spoke has a distinguished history of community service providing: free gallery talks, artist demonstrations, hosting school visits and tours, as well as showcasing local emerging non-member artists and student artists in special exhibits. In addition, the gallery has been a part of The Town of Huntington’s Art Walk since its inception. b.j. spoke actively supports charitable causes with exhibit sales proceeds donated to organizations such as the Long Island Chapter of the AIDS Collective, the Huntington Breast Cancer Coalition, and the Family Residences and Essential Enterprises, Inc. (FREE). Other gallery events that bring national attention to the art world and enhance the Long Island Art Scene are the two national art competitions the gallery organizes annually. The Winners Exhibitions, for EXPO, PAPERWORKS (FOCUS 2018) are judged by curators from major art institutions such as the Museum of Modern Art and the Whitney Museum of American Art. Our art events attract hundreds of people to the Town of Huntington each year. In addition to viewing and learning about the artists at the gallery, visitors patronize local shops, restaurants, hotels, and attractions helping our town to flourish and bring recognition to our local artists. b. j. spoke gallery has been bringing art to the community and community to local artists for over 43 years. The gallery is member owned and run. All that is required to run the gallery, produce and promote the monthly events, hang and take down exhibitions, plan and manage national competitions, and create an open and supportive environment for local artists, is done solely by our members. We need support from all those who appreciate the arts so that we can maintain the gallery’s efforts for years to come. We hope you will become a Patron/Supporter of b. j. spoke gallery. All donations are greatly appreciated. If you have a business contact who can sponsor some of our events, website or other special projects, please contact our gallery director, Lorraine Carol, or any of the members of the Executive Board. b.j. spoke gallery is a 501(c)(3) not-for-profit organization. All donations are tax deductible. You'll receive our monthly newsletter, our NEW online magazine SPOKE/IN, invitations to opening receptions, updates on gallery events, and more. Sound good? Sign up here.